We've been waiting for you all summer. Ever since the children at Meadow Elementary School in Petaluma, California plopped us in the ground, watered each little seed, and nurtured every plant until we were ready to make our debut. Every one of us has a story. The kids even gave each of us a name! Won't you adopt us? Or maybe one of our cousins, the ornamental squash, in the next organic bed over? We would love to beautify your home, maybe even add a sparkle of Fall charm right outside your front door! 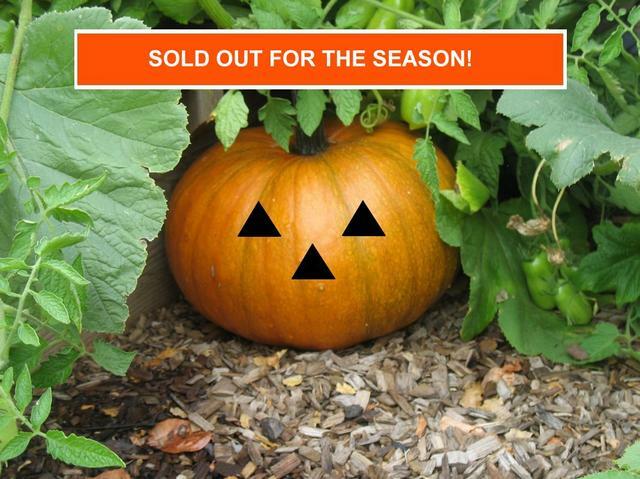 Click on Jacqueline above and reserve your very own organically-grown pumpkin or ornamental squash, which we'll keep nurturing for you right until Harvest Time. And when you take one of us home, your contribution will help build one of the most ambitious programs for organic gardening instruction right here in Northern California! Meadow School's Common Ground Garden. ALL VEGETABLE AND FRUIT PURCHASES GO DIRECTLY TOWARD SUPPORTING AND EXPANDING OUR GARDEN! All images on this web site are cpyr. 2012, Meadow Elementary School. All Rights Reserved. Use of any images on this site without express written permission of the copyright holder is prohibited.